Colonel Mustard in the library with a candlestick! Professor Plum in the study with a pistol! Sound familiar? Yup, it's everyone's favorite childhood game, Clue! In an effort to relive my childhood but this time, with a foodie twist, I've gotten together with a bunch of my favorite bloggers to form the CLUE Society. Each month, we'll be cooking up a dish from a fellow blogger's blog but in the true spirit of the game, the who, what, and where is a secret until the grand reveal. For the first round of the game, we were tasked with finding a recipe on our CLUE buddy's blog that we'd like to grace our Thanksgiving table. Now, I love me some Thanksgiving but I'm also always looking for recipes that I can make (and eat!) now! Especially if those recipes involve cake! So I actually had an ulterior motive when perusing Susan's fabulous blog, Create Amazing Meals. Needless to say, Susan did not disappoint. A few years ago, Susan made a delicious looking pumpkin cake. Now, I know pumpkin desserts are everywhere in November but there is a reason they're so popular. It's because they are delicious! And a pumpkin cake is perfect because I love the flavor of pumpkin and all those warm spices but I'm not a huge fan of the texture of pumpkin pie. Susan's cake was the Pumpkin Almond Cake from the Baked Elements cookbook. That sounded really delicious but I didn't have any almonds. I mean, I wanted the pumpkin flavor to stand out. Right, that's my story and I'm sticking to it. And so, I whipped up this pumpkin spice cake with cream cheese frosting. In all fairness, this is a pumpkin bread. It's dense, fragrant with spices, and would be perfect with a giant mug of coffee after a belly-busting Thanksgiving feast. Plus, the frosting makes it so festive, I'm calling it a cake. So who dun' it? Azmina in the kitchen with a cake pan! Preheat oven to 350 degrees F (175 degrees C). Grease and flour three 7x3 inch loaf pans. In a large bowl, mix together pumpkin puree, eggs, oil, water and sugar until well blended. In a separate bowl, whisk together the flour, baking soda, salt and pumpkin pie spice. Stir the dry ingredients into the pumpkin mixture until just blended. Pour into the prepared pans. Bake for about 50 minutes in the preheated oven. Note I have also successfully made half this recipe in an 8 inch round cake pan as pictured above. But I have to warn you, this is good stuff and more is always better so you really should make the entire recipe. Cut me a slice while I put the kettle on. WOW - this was a great selection for this month's theme - so perfect! I just wish I had a slice right now. I am so happy that we are both part of the C.L.U.E. Society! Happy Wednesday!!! Can I join you in that hot mug of coffee with a big ole slice of that cake? It looks amazing. I'm keeping my fingers crossed that I get you sooner than later! Azmina in the kitchen with a cake pan! I love it! As much as I loved playing Clue as a child, it would have been a whole lot better game if food had been involved. That is one special pumpkin spice cake. So glad you dun it, Azmina! Hi Azmina, I'm Ramona from Curry and Comfort and also a member of the C.L.U.E. Society. 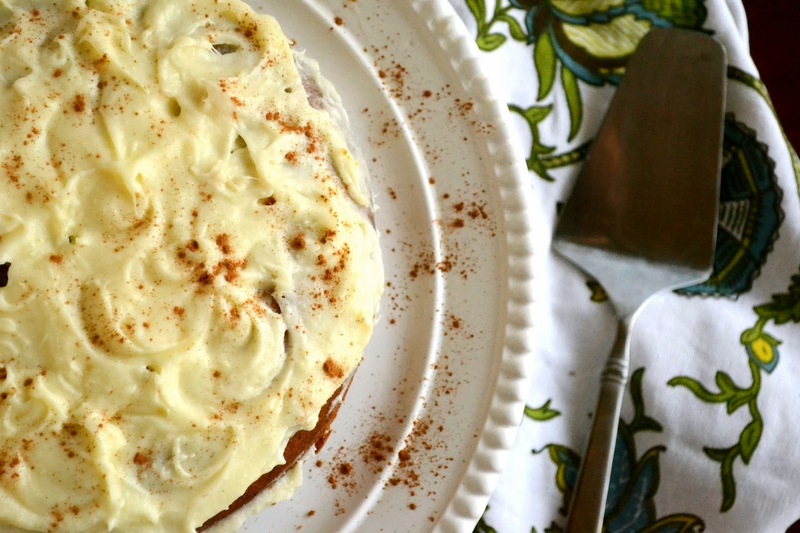 this pumpkin spice cake looks like all it needs is a fork with me sitting in front of it. :) What a fabulous choice for the Thanksgiving table. Looking forward to getting to know you and your blog better over the coming months. HI! I am Kelli from Kelli's Kitchen and also a member of the CLUE Society - your cake looks so tasty and would be a welcome addition to our Thanksgiving table. I look forward to working with you soon! Great choice! I love Susan’s blog! Her food is always presented so beautifully! Your cake and photos are beautiful as well! Glad to be part of Blogger C.L.U.E. society with you! Looking forward to getting to know your lovely blog! So glad you found something fun to make - who can resist cream cheese frosting? Your cake looks beautiful! This is an bsolutely beautiful cake….And would grace the Thanksgiving table. sooo when can i come over?coffee on me, i promise. Excellent dessert for any Thanksgiving table! I am all over pumpkin! 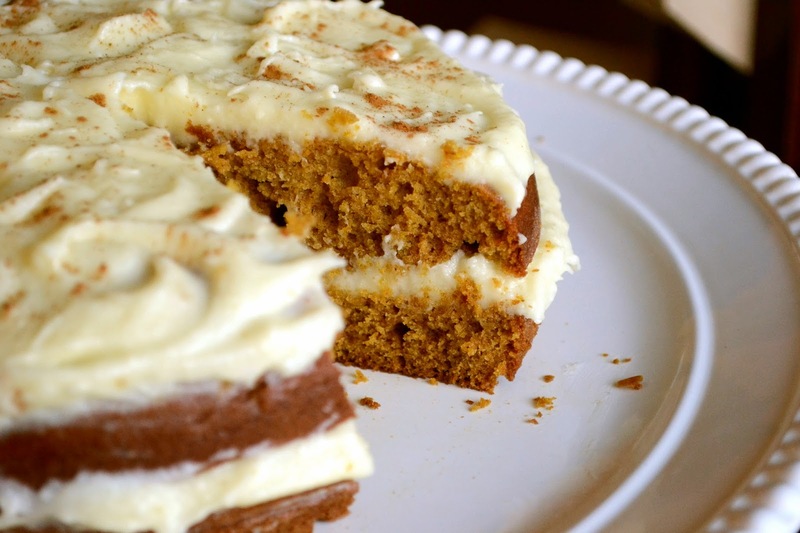 such a beautiful pumpkin spice cake :) wow pass me the slice.. I think you've summed up the CLUE Society best I've seen yet! Well done. And this cake?? That's pretty darn awesome too. Pumpkin spice is a flavor I use all year round. This will do! So nice to be in the group with you, I'm looking forward to the following months! I'm drooling. And, if I didn't have about seven more blogs to read tonight I would be sorely tempted to trot out to the kitchen and make one of these... Great choice, Azmina! Susan is one of my favorite friends I've met through blogging - how fortunate to get her blog. She is an amazing baker. Looking forward to getting to know you through Clue! Oh dear - so moist - so decadent - so - did I mention I LOVE cake?! Azmina, you did good with your cake pan! I am intrigued by this Blogger Clue Society? Is it kinda like the Secret Recipe Club? Either way - lovely cake! Hi Shashi! Blogger CLUE is a great group of bloggers that secretly make a recipe from an assigned group member's blog to match the monthly theme and then we do a grand reveal! If you're interested in joining, you can contact Kate, Christianne, or Liz who have all commented above. Like you, I am not a huge fan of the texture of pumpkin pie but I LOVE taste of pumpkin! This cake is a great alternative. Hope you are doing well! What a cute idea...I used to love playing the game of Clue! I am so inspired by this cake...looks like something even I can handle. I've never tried cooking with pumpkin, looks delicious my friend! Mannn, I thought I had commented here already! As my son would say, "silly momma!" How cool is this! I love how you turned pumpkin bread into cake - why not?! A cake is always a bit extra special. Plus, this sounds delicious. Thanks for the lovely recipe of the pumpkin spice cake. I like to try this in my kitchen and will see how much it is tasty according to my taste. For it looks it is so lovely and delicious. I would love a piece of this cake. Wow, marvelous blog format! How long have you been blogging for? you make running a blog glance easy. The total glance of your website is excellent, let alone the content material!